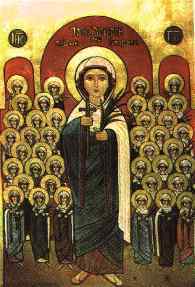 The holy and glorious Virgin-Martyr Saint Demiana (in Arabic الشهيدة دميانة), the chaste Coptic Orthodox virgin, was martyred with her companions, the Forty Virgin-Martyrs, on Tobi 13 (January 22) toward the end of the third century A.D.
Demiana loved to pray and read the holy books in the seclusion of her room. She often cried while praying, as she felt the love of her Savior the Christ fill her little heart. When Demiana heard that her father had knelt before the idols, she left the palace and went immediately to him. She said, "How could you deny your Savior who shed his blood to save you, and kneel down to stone idols dwelled in by satan? What you did, my father, is cowardly and shameful." When Marcos heard his daughter's words he came back to his senses. He said, "Woe to me, how could I fall in the Devil's trap and worship those idolatrous statues." Then he got up immediately and went to Diocletian. He crossed himself in the name of the Father, the Son, and the Holy Spirit in front of everybody, and cried with a loud voice, "Let every one know that I worship the God of heaven and earth, my only God and Lord Jesus the Christ." Diocletian was troubled and tried his best to change Marcos' mind, but this time the Holy Spirit had filled his heart, and he testified even boldly that he was willing to die than to deny his Savior. Diocletian became infuriated, and ordered the soldiers to kill him. When the Emperor learned that it was Marcos' daughter Demiana who had changed her father's mind, he ordered one of his commanders to take one hundred soldiers and attack the palace. "First, try to convince her to worship our idols," said Diocletian. "But, if she refuses, threaten her, torture her, and even kill her so that she will be an example for the other Christians." When Demiana saw the soldiers approach the palace, she prayed to God to strengthen their faith until death. Then she told her friends, "If you are willing to die for Jesus' sake you can stay, but if you cannot stand the torturing of the soldiers, you would do better to hurry and escape right now." The forty virgins answered that they would not lose the eternal life just to enjoy a few moments in this evil world. Saint Demiana has also a great Coptic Orthodox convent in Belkas, Egypt, and many Coptic Orthodox churches in Egypt bear her name. This page was last edited on October 24, 2012, at 17:01.